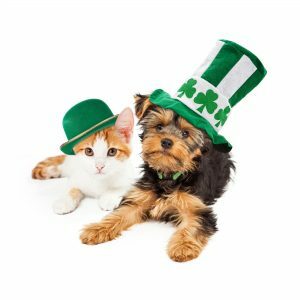 Voted BEST Pet Sitter 2019!! Author, Noelle Dunn for Professional Pet Sitting Etc. How much do you love your dog? Dogs are easily the most perceptible pets and this makes it easy for them to be able to interpret your behavior and react accordingly. Also, dogs are very warm, loving and loyal and they always want to make their owners happy. The most enviable dog and owner relationships are those ones where they appear to have a connection and they understand each other. However, that did not happen overnight, it took conscious effort to create that kind of rapport. Therefore, as a dog owner who desires a closer relationship with your dog, you should also be interested in ways to show your dog you love him. The best way to show your dog your love them is to hold them and touch them as often as possible. This will make them feel safe and loved. When touching them, you should do more than pat them on the head; instead touch them like you would relate to other humans you love. When you are relaxing, you can let them sit on your laps or pet them when they lie down beside you. Most young dogs love to run around and play. When you create time for your dog to run around and exercise daily, they will love you the more because it shows them that you have time for them. It is a win-win situation for you because you will have a happy dog who will be well- behaved and you will have more time to bond. So, always make out time to go to the park and also take regular walks with your dog. Your dog might not like getting water on their body, but a well-groomed dog is always a happy dog. So you have to make out time to groom your dog regularly. There are grooming services that help pamper your dog and make them feel like royalty. However, some of these services may cost more than you can afford, so you can groom your dog by yourself at home. This will be more relaxing and also give you the opportunity to bond more. While it is relatively safer to keep your dog indoors most of the time, the disadvantage is that they might not get enough socialization. Therefore, you should make out time to allow your dog meet other dogs and make friends. A good way to do this is to visit dog parks and have picnics where other dog owners are. However, if your dog is not properly trained, then you should keep him on a leash so he does not get into awkward or unpleasant situations. A healthy dog is a happy dog. Your dog needs to have regular checkups whether he falls ill often or not. This can help forestall diseases and unpleasant experiences. In addition, your visit to the vet will give you the opportunity to discover new ways to take care of your dog. Loving your dog is one thing. Showing him isn’t very hard but it does take just a little more effort! How do you show your dog that you love him and keep him happy? Dorinne Whynott, is a long time animal professional. She is a successful business owner establishing one of the largest pet sitting companies in New Hampshire since 1990. Click to Read her complete History. Professional Pet Sitting Etc. is a leading business in the pet care field and continues to grow since 1990. It is an AWARD WINNING business, having been awarded the 2015 Best Pet Sitting , 2015 Best Dog Walker, Business of the Year Awards in 1996, 1997, 2006 and 2010. It boasts 30+ amazing pet sitters on staff, over 3000 clients in 38 cities from Nashua to Concord, NH. Hundreds of satisfied client testimonials can be found on their website and more 5 star reviews on their Facebook page, Google+ page and more. They have sustained an A+ rating with the BBB, A rating with Angie’s List and are unmatched in the Pet Sitting Industry in New Hampshire. Go to Professional Pet Sitting Etc. Website for more information on the best pet sitting company or click on “New Client“ to contact us or register for dog walking or pet care. This article can not be copied in part or in whole without specific written permission by the Author and Owner. We may love our dogs, but certain behavior can make it difficult to enjoy the relationship we want with them. When puppies pee in the house, we get so frustrated. This frustration can make training difficult from the point of love. It is important to note that not all dog training techniques have effective results, some potty training skills are complex, but other techniques are easy to implement. Here are some steps to house train your puppy. It is very normal to experience anxiety, joy, fear and curiosity when you get to a new environment and meet new faces. This also happens to puppies. From day one set the foundation for the long-term relationship with the pet and establish routines to be carried out every day. Consistently follow them for your puppy to learn quickly. For you to properly carry out house training for your new puppy, you should learn more about the breed characteristics before you begin the training. There are those breeds that will learn faster than others, those that will be more stubborn than others. Hopefully, you have learned everything about the breed prior to bringing him home, but if not, please do it now. It will help in the long run. To avoid the feeling of disappointment when training your puppy, you should know what to expect and what not to expect from that specific breed of dog. Understand how the dog communicates when it needs to go to the bathroom. Study their cues so you can help them in time before they have an accident in the house. During potty training time, keep an eye on the puppy so you can detect early signs indicating he needs to go. When they begin to circle, whine, sniff, scratch, or suddenly change behavior, you need to be on the alert and bring the puppy out of the house to the designated potty area. The instant you catch your puppy relieving himself in the house, startle him with a sudden noise, like clapping and immediately lead it outside. Just startle, do not scare. This will let them know you do not approve of their action. Being consistent in the same startling action or word will help the dog understand and learn to do the right thing by going outdoors. Do not punish them for accidents; they know when you are not pleased. Forcing the puppy to smell its mess will only make it fear you and will not help in building your relationship. All pets know their own scent. 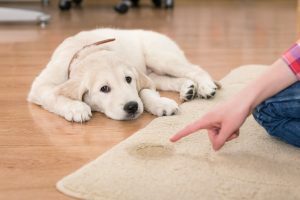 Punishment will also send the wrong message; the puppy may understand that you don’t want them going to the bathroom inside and this could make them do it in hidden places that you cannot reach. When you pick an area outdoors for the dog and take him there each time to go to the bathroom, the dog will learn and associate that location with peeing and pooping. Choose an area that is easy to clean and can be reached quickly in case of accidents. Avoid areas where other dogs have gone until your pup has received his third set of vaccines. This is to protect the puppy from catching infections that may be detrimental to its health. Use a potty command like “Go” or “Go Potty” or “Hurry Up”, each time you take the puppy outside. They will begin to associate the command to going to the bathroom. Consistently using one command will speed up the learning process and avoid any confusion. Each time the puppy uses the appropriate area without any accidents, appreciate it cheerfully and always let puppy know you are pleased. When you do this consistently, they are emotionally driven to do even better and avoid peeing in the house. When the puppy is happy about potty time, it will always look forward to it. Train the dog to hold until the right time. Play Time or taking a walk, after potty time can be a reward they expect and can encourage them to wait. Never interrupt the puppy when going to the bathroom in the designated potty area. We want to create a relaxing environment that they can enjoy. A treat afterward can encourage and help house train efficiently in possibly a shorter time. Cleaning the area inside where your puppy had an accident, will stop them from wanting to go there again. Use an enzymatic cleaner to remove the odor that can attract the dog back to that area. Using ammonia-based cleaners will do the opposite since urine also contains ammonia. White vinegar also works well to counter the smell of ammonia. If you have wall to wall carpeting, you may need to have a professional come in to clean areas thoroughly. If you can, opt for bare floors, like tile or hardwood. They are much easier to keep clean. Enjoy your Puppy for a lifetime!! Over the years, our human desire to locate our homes in lush green valleys and quiet areas from bigger cities has also meant that we’re stepping into regions that truly belong to the wildlife. Consequently, reports of wild animal sightings in and around homes have also increased. While human expansion will only increase, animal home will be encroached upon. Coming into contact with a bear in your yard can be scary but simple efforts on your part can help in preventing bears coming around your home. To begin with, it’s important to acknowledge the fact that bear attacks on humans are extremely rare. Bears generally try to avoid contact with humans. Thus scaring bears away is not a very difficult task. It helps to know what bears like and do not like to come up with answers that will work for us. When you see a bear in your yard, it’s advisable to not panic and see what the bear is up to first. Try staying quiet and keep yourself safe (inside your home preferably). Once you know why the bear is there, you may have your answer. Why do they lurk around homes? Bears do exactly what we had to do a few hundred years ago- hunt for food. The scent of food is the prime reason that attracts bears around your house. Their olfactory abilities are almost seven times that of a bloodhound’s. If they locate a source of their day’s meal around your area, like your garbage bin or barbeque leftovers, they often come back looking for food in the same places. Mother bears who’ve recently born cubs may also stroll into unknown territories for food. While the first reason is the most common one, it isn’t the only determinant of bear behavior and intrusion. Often within a sleuth of bears, young male bears aren’t tolerated by the adults in the group. This leads to young male bears to wander into territories looking for shelter. Often it is this very type of bears that tend be lesser frightened of humans and a commonly known as “nuisance bears”. Essentially omnivores, fresh water fish, berries and succulent vegetation are a part of the common bear diet. But hunting for them during off season is a laborious task for which bears travel almost hundreds of miles to stock and eat before their hibernation period begins. Quick access to human food and often leftovers, becomes a favorable choice as the bear becomes aware of a very EASY food source. A possible reason for a bear to lurk around your home’s vicinity is because it has found food around. Bird feeders are like candy to a bear. Bears do not prey on humans. But in extremely rare cases, if the bear has tasted human flesh before then there may be danger. Also pets can be in danger, especially if you feed your pets outside. Chicken coups and Rabbit hutches make easy prey for bears. Does this happen during a particular time of the year? Yes, fall and spring. During fall, bears enter a stage of hyperphagia. They begin to consume as much as 20,000 calories a day. But in lower altitudes where food is available throughout a year and their diet isn’t affected because of snow and frost, they do not hibernate. 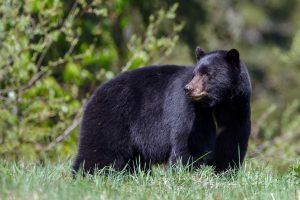 This is quite common in urban and sub-urban areas, where, by human provisions like pet food, bird food, uncovered garbage and birdseeds, have allowed bears to have access to food. In spring, Mom bears need to feed their cibs and are always looking for easy food sources. Once a Mom has taught her cubs where to find food at homes, those cubs will be looking for similar sources as they grow older. How do I keep them away? Preventing bears around your home is easy and can be done so by implementing some basic rules for all your house members. If you’re new to the area or haven’t done this before, pay a visit to a local departmental store. They usually keep all bear-proof necessities and all those items that would aid in scaring bears away. These cans and bags keep the scent of food air locked, so that the animals cannot smell them and also, some of them have a complicated lock system that the bear would fail to open. Bears do come around if you happen to have fruit trees, bird feeders, pet food dishes, leftovers, and your barbeque grease pan underneath. Make sure all of them are cleaned in regular intervals so that they aren’t attracted to the scent of leftover food. If you have livestock, beehives or pets at home, and the bear happens to be hungry, you may want to invest in an electrical fence. You can either use ammonia or bleach, to clean your house surroundings and garbage cans. This will eliminate food scents and prevent attracting bears around your home. This one is only and only for serious emergencies. Only if you see that the bear happens to be charging towards you for an attack, should you use a Bear pepper spray. The spray may or may not stop him and you may miss spraying him in the right place (face) at the right time. It is better to be far away or in your home. Bears are very fast and can out run you. Bears usually like quiet areas to lurk and feed in. When a bear is spotted most people pear out their windows and take pictures trying not to disturb the bears. THAT IS EXACTLY WHAT BEARS WANT, PEACE AND QUIET. You want to make your yard unpleasant. So, noise, noise, noise. Find radios that have motion sensors to turn on, scaring the bear as it walks to your home. Put it on talk radio. Most wild animals will go away from human voices. Or put it on a rock station with loud booming music. This may not be pleasant if you are close to your neighbors. These are simple hacks to keep them away. Loud noises using pots and pans and using Air horns can scare them away. You can buy an Air Horn from Walmart for $10. I have successfully, scared bears from my house with pots and pans. Bears would visit around my home weekly. We have lots of wild blueberry bushes around my home. Every time I saw any bears around my house, I would open a window or go outside if I was a safe distance and just yell, scream and bang pots and pans until they ran away. Usually, they were gone in a few minutes. Doing this consistently, I have had no bear sightings in the past 2 years. If you don’t prefer much noise all the time then motion sensor lights are also a good idea to alert people at home that someone or some animal may have entered your yard. Although, this may not suffice in scaring bears away. Install these sprayers by attaching to a garden hose, they work along motion sensory traps and it sprays water at the bear or any other animal (or person) when motion is detected in that area. Good luck and be safe! It is good for you, your family, your pets and the bears. Research Breeds and Choose Wisely! For dog lovers, there is probably nothing more exciting than the idea of welcoming a furry new buddy into the family. However, preparing for a new puppy is not all fun and games. A lot of work needs to be done in order to ensure that both the puppy and the owner are comfortable once the pup arrives. Below is an 11 step guideline on how to properly prepare. This way whether it is your first pup or you are simply adding to the furry friends club in your home, you know and have exactly what you need to hit the ground running. Where will the puppy sleep? This is one of the most basic and obvious puppy preparations essential, yet it is one of the most often forgotten steps. You will need to determine whether the pup will be in or out of a crate. 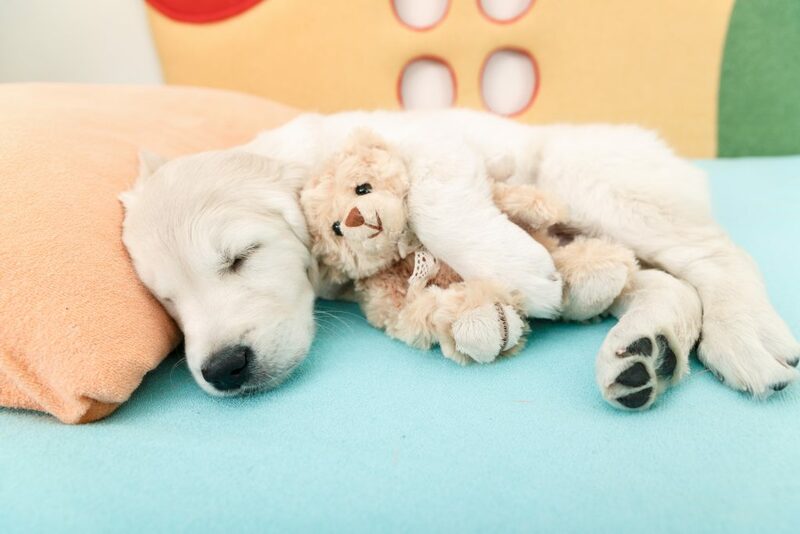 Make sure that the room and the specific sleeping areas are properly prepared or puppy proof. Look for electrical cords, things to chew on or get knocked over. Crating is the safest place when the puppy can not be supervised. What will the puppy eat? The little baby’s nutrition is the next big thing you need to worry about. What many first time pet owners fail to realize is the fact that food meant for fully grown dogs is not suitable for pups. It is best to do some research and find out what is recommended for the specific breed of puppy you are bringing home. We live in a career oriented world, but this fast paced life should not hinder you from the joys of being a pet owner. If you have a tight work schedule or happen to travel a lot, you will need to look into pet care services around you. This will ensure that your furry little friend is taken care of, even when you are out and about. A good pet sitting business offers both ongoing daily mid day visits while you are at work or a supper visit when you want to go out for dinner and a play, with everything from potty breaks to puppy playtime. Little puppies are in a lot of ways very similar to human babies. When they are about to start teething, they go through their oral stage. This is where the pup feels the urge to chew on anything and everything in its path. It is therefore very important to get rid of potential choking hazards. This can be anything from spent match sticks to scrabble board letters. Before deciding on a puppy, research the breeds. 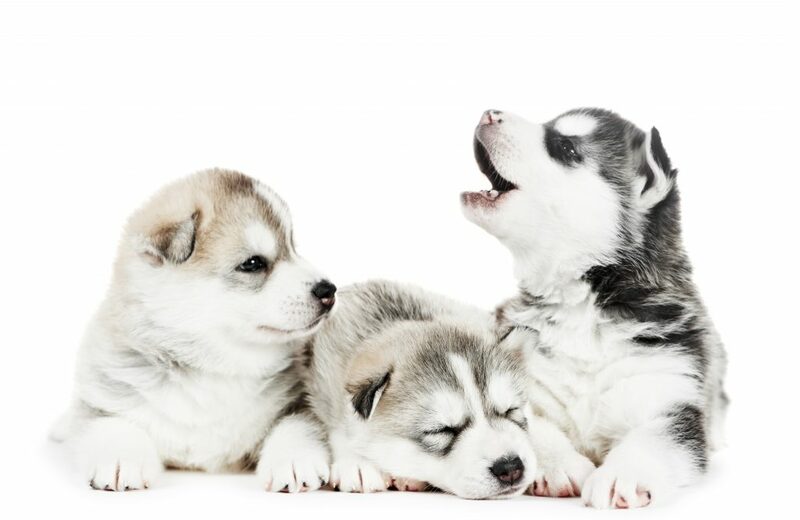 If you are a family that is very busy, lives in an apartment, you may not be happy with a breed like a Siberian Husky who needs alot of exercise, room and strict training. If you would hate to see your yard dug up, you may not want a breed known to dig. Research all of the breeds. Many of them are adorable but may grow up to have personality traits that will not fit into your family. Remember, you are choosing a member of your family that will come with good and bad traits. They will be with you for 13-18 years, depending on the life of that breed. Choose wisely. Dogs are undeniably smart. However, it is super important to train them while they are young in order to ensure that they remain well behaved throughout their lives. Investing in training is the number one thing every pet owner should do. Make sure to book sessions for basic training and I would advise going further into advanced training to teach your dog to do everything off leash. The more you invest in training for the first 2 years of your dog’s life, the more enjoyable your dog will be in every aspect of your life. When you get rid of the choking hazards, it is always a good idea to invest in dog toys. These will allow the puppy to indulge their chewing urges with reduced irritation and increased protection of your shoes and furniture. A proper grooming kit should include dog soap and shampoo. These come in handy especially when you are anticipating a playful pup that isn’t afraid to get down and dirty. The grooming kit should also include nail clippers or grinders, to keep the nails short and clean. This is also the time to look for collars that will grow with your puppy, leashes and harnesses. Now is the time to decide what you want. There are many types and designs to please anyone. If you are lucky enough to have a fenced in yard, getting exercise is easy. Playing ball or any other game in the yard that will get your puppy running and burning off excess energy is great. If you are not so lucky, then you will need to take your dogs on routine walks at least once or twice a day. Puppies are naturally playful bundles of joy. They also happen to be very restless and will end up spending most of their time running up and down the house. Keeping fragile items such as flower vases and computers protects them from being knocked over and damaged. Any electrical cords can be deadly, so tie them up and away from curious pups. They don’t call puppies our furry little friends for no reason. As a dog owner, you will have a lot of fur to deal with. Investing in a vacuum specifically designed for pets is therefore a great idea. Finally, you need to fill everyone in your home about the new adventure. This helps to prepare them psychologically. It also makes distribution of work and responsibilities a lot easier. Everyone in the family should also know the puppies routine and training commands. It will help the puppy learn quicker. After all is said and done, preparing for a new pet is not rocket science. However, it is important to invest a lot of time and effort into ensuring that everyone is comfortable with the household addition including the puppy itself. The tips provided above will definitely help ease the transition, and will ensure that your first moments with the cute little fur ball will be precious memories you will hold on to for a long time. Copyright © 2013, 2014, 2015, 2016. All Rights Reserved.